On paper, building codes have reduced energy use by over 30 percent in the last two decades. But building codes don’t achieve energy savings if they are not effectively implemented and enforced. The Institute for Market Transformation (IMT) found that staggering rates of noncompliance, as high as 100 percent in some jurisdictions of the United States, have eroded the gains from code development and adoption. If all new construction in the United States fully complied with building energy codes, the country would achieve annual energy savings of $63-$189 million, or lifetime savings of $37.1 billion. In many parts of the world, code enforcement is the responsibility of local governments, where institutional capacity and resources are limited. Cities face a number of challenges in implementing and enforcing building energy codes. Two common challenges are insufficient awareness of the importance of energy efficiency and a lack of knowledge of building science or technical expertise. For many cities and countries, this knowledge gap—which applies to both code enforcement officials and building industry stakeholders—throws a wrench in the building energy code enforcement system. To combat the knowledge gap and ensure successful implementation and enforcement, Mexico City, and other local and national governments, must invest in awareness campaigns, capacity building strategies and robust compliance-check systems. Code enforcement officials are often responsible for enforcement of several building codes, such as structure, fire safety and energy codes. Resource and knowledge limitations may lead these enforcement officials to undervalue building energy code enforcement—a challenge revealed in a 2010 study by the American Council for Energy Efficiency Economy (ACEEE) in the United States. Similar limitations apply for the private sector, where building architects and construction staff have to navigate through numerous regulations and energy codes. There are discussions of different ways to address resource limitations, including, but not limited to, streamlining institutional capacity, sustaining funding resources through permit fees and use of third-party enforcement firms. Policymakers and energy agencies can raise awareness about energy issues and the multiple benefits of energy efficiency through conferences, workshops and various media channels. Public communications platforms should discuss current code requirements and the consequences of non-compliance, to ensure that all market actors (designers, engineers, developers and construction industry and finance experts) clearly understand what building energy codes require and the steps they need to take to ensure that codes are effectively implemented. Furthermore, recognition and award programs could also be helpful in incentivizing code officials and industry stakeholders to support compliance. For example, IMT and the International Code Council (ICC) created the U.S. Standard Bearers Award, which recognizes state and local jurisdictions and individuals who have reached compliance with energy codes and achieved energy reduction in buildings. Awareness campaigns that target building owners and occupants can lead to increased interest in effective implementation of codes, providing additional incentives for developers to comply. If coupled with building ratings, awareness campaigns can inform occupants about a building’s energy use and allow them to make informed utility decisions. For instance, in China, real estate developers are required to disclose information about a building’s expected energy use when selling a property. In addition to a lack of awareness, the lack of technical expertise on how to enforce and comply with building energy codes adds to the knowledge gap. Governments need to establish targeted training and educational strategies for code enforcement officials and industry professionals. Trainings for code enforcement officials should focus on how to check compliance and be audience-specific. For example, City Energy, a joint project of NRDC and IMT, found out that single-discipline inspectors are only interested in learning about code requirements related to their specific disciplines (ie: fire safety or seismic requirements). Establishing local experts and updating code training resources is an important first step. Cities can expand on this by “training the trainers” by partnering with universities and working with industry professionals to incorporate energy efficiency into educational courses and professional certifications. Additionally, international best practices show that compliance software can help simplify design evaluation and assure compliance among all actors involved in code implementation. Where software is not accessible, simple spreadsheet tools can be equally helpful. In a pilot program in Indian states Telangana and Andhra Pradesh, more than 700 architects, engineers and experts received training on Energy Conservation Building Code (ECBC) to boost the states’ building code implementation and enforcement capacity. In Telangana, the state government, Administrative Staff College of India and Natural Resources Defense Council, along with experts at the Indian Institute of Information Technology (IIIT), conducted workshops to increase capacity among stakeholders on the code compliance process. Other initiatives, supported by the national energy agency, Bureau of Energy Efficiency, include setting up state level ECBC cells and a mobile phone app for building designers to ensure code compliance. However, as these efforts are relatively new, it remains to be seen how effective they will be. The third strategy to reduce the knowledge gap involves a robust compliance-check system, which ensures energy code realization. The International Energy Agency (IEA) identified four key stages throughout a building’s lifecycle when compliance checks are conducted. These include the design, construction, pre-occupancy and post-occupancy stages. Compliance checks are most effective when integrated with local building permit systems. 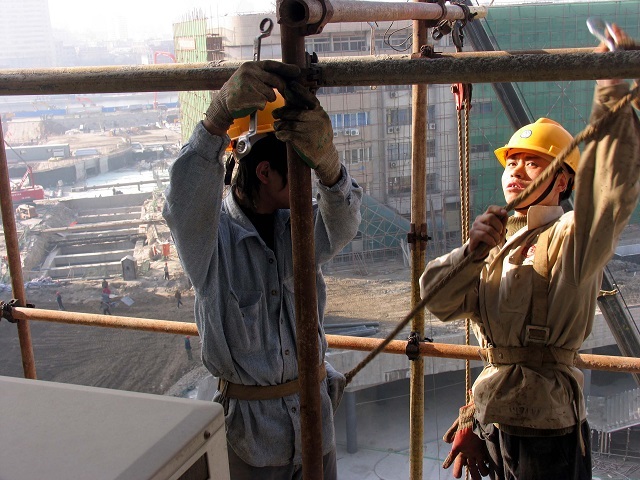 According to Pacific Northwest National Laboratory, building energy codes are integrated into enforcement processes in China. First, this requires a certified third-party to verify mandatory code compliance before developers may apply for construction permits. Second, a third-party supervisor and local authorities check and inspect the construction process. Finally, upon project completion, all parties (developer, designer, constructor and supervisor) co-verify that the project meets all standards, including building energy codes, before the developer registers the project and applies for occupancy permits. If buildings don’t comply with energy codes, the local government can suspend construction, withhold permits and issue fines. The robust compliance-check system in China has been successfully implemented for many years and has inspired discussion in research publications, including those by the ACEEE and Lawrence Berkeley National Laboratory. Building energy codes are important for saving energy, but implementing and enforcing them can be a challenging task that requires time and resources. Even the aforementioned examples of good practice have significant room for improvement. It is therefore crucial that code-adopting countries and code-implementing cities mobilize resources and share best practices to ensure compliance and provide better buildings for all.